In Matang Village at the Longchang Town, Kaili City, Guizhou Province, people call called themselves Ge rather than Miao. 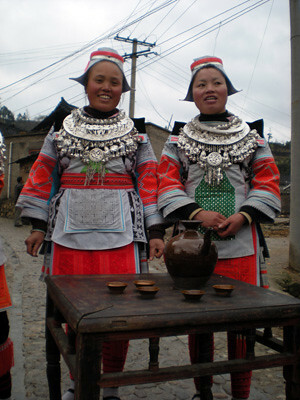 They are recognized as one of the divisions of Miao in China. With aid from the Chinese government, Matang Village and Shilong Village both developed a circle-shaped public venue to perform their traditional dancing in order to encourage tourism. Performers line up at the entrance of the village and the sound of firecrackers welcome guests. Before getting into the village, guests are served homemade rice wine during traditional singing. Village people pour wine into guests’ mouths to represent their respect to the guests. After the short welcoming ceremony, the entire group moves to the square for the formal performances.